Fifty people died as a Boeing 737 passenger plane crashed-landed in the city of Kazan in central Russia on Sunday. Authorities are investigating the causes of the tragedy. 21:17 GMT: The results of the first reading from the black boxes of the Boeing 737 will be known by Tuesday, the Ministry of Transport announced. The black boxes discovered at the crash site are significantly damaged, and further work might be needed to retrieve the recordings. "Further work with them [black boxes] is needed, and will be undertaken by MAK (Interstate Aviation Committee), and the first information will be known no earlier than tomorrow [Tuesday]. But overall establishing a full set of reasons for the crash will take a long time," Ministry of Transport head Maxim Sokolov said, as quoted by RIA Novosti. 19:24 GMT: US officials and Boeing representatives are traveling to Russia to assist in the crash investigation. The US National Transportation Safety Board (NTSB) is sending a three-person delegation, NTSB spokesman Eric Weiss told RIA Novosti. The team - led by air safety investigator Dennis Jones, who works with the federal agency responsible for investigation aviation accidents in the United States – will leave for Russia “as soon as possible.” The team will arrive in Moscow before heading to Kazan. 15:50 GMT: The airline Tatarstan has suspended operations for the remaining Boeing aircraft in its fleet following Sunday’s deadly crash, the company said in a statement. Speaking before a governmental commission tasked with investigating the accident, Transportation Minister Maxim Sokolov said the fate of the last plane would be decided within a month’s time. “The airline only has one Boeing left. It’s old; 23-years-old. What will be done with it will be decided within the framework of the inquiry conducted by the Federal Air Transport Agency and the Investigative committee,” the minister said. The airline’s fleet currently consists of 4 Airbus 319s, the now-suspended Boeing 747-400, 15 Cessna Grand Caravans and two TU-154s. 14:00 GMT: Kazan airport won’t stop any Boeing 737 flights. "Boeing 737 flights won’t be banned because of the air crash at Kazan", says Transport ministry head Maksim Sokolov. The airport also isn't banning planes from other airlines. 13:50 GMT: The General Prosecutor's office has said that Moscow's Domodedovo airport, from which the doomed plane departed, will undergo an "extensive review" to determine if its staff contributed to the causes of the crash. 13:00 GMT: Transport ministry head Maksim Sokolov told RIA Novosti the remains of the bodies of the deceased have been sent to the morgue for further examination. 12:30 GMT: Airport authorities report that the airport has reopened. 12:22 GMT: The BBC has released the photo of the British national who was among the victims of the crash. 11:55 GMT: The bodies of the deceased will only be released to the relatives following DNA testing. This could last anything from two weeks up to a month, according to Nail Nigmatulin of the Bureau of Forensic Medical Examination, speaking to RIA Novosti. 11:49 GMT: The black boxes from the Boeing crash have been sent to Moscow for analysis - Russia's emergency ministry told ITAR-TASS. 11:00 GMT: Meanwhile published footage of the Boeing's shocking nose-dive has been circulating. 10:21 GMT: A source inside Rosaviation has disclosed that the last time the plane had undergone full maintenance was in 2012, during which no problems were discovered. The source added that the last routine checkup took place just two days before its fatal flight. 09:41 GMT: Experts have started work on the black boxes, the location of which has earlier been identified at the center of the hole created by the plane’s impact with the ground, ITAR-TASS was told by officials with the Tatarstan airline. An investigative official told Interfax, however, that the devices are badly damaged. “The casing of the recovered on-board recorders has been badly damaged... but the black boxes have been passed on for decoding. Regardless of the great damage, I think we'll be able to extract some information out of them." 09:34 GMT: Prime Minister Dmitry Medvedev has addressed the nation. "Yesterday a tragedy struck. A passenger plane has crashed in Kazan, 50 people have died. On behalf of the government, I would like to extend our deepest condolences to the families and friends of those who perished. Let us honor their memory," the vice president said at a meeting with deputies, RIA Novosti reports. 09:14 GMT: Transport Minister, Maksim Sokolov, told The Voice of Russia radio station that all five versions of the circumstances leading to the crash will and should be considered valid until the investigative committee has finished its work. However, he ruled out the possibility that an act of terrorism was to blame. “Until the investigative committee has finished its work, all five theories may be valid... we should hurry up and get those black boxes." 08:52 GMT: Authorities will also carry out a thorough investigation of the airline's safety measures and regulations as well as the diligence of authorities tasked with supervising airline companies,head investigator Vladimir Markin told RIA Novosti. "A video was found and a detailed examination of the fatal trajectory of the plane is being carried out," he said, reminding the press that DNA samples of the deceased, as well as fuel samples, are also being analyzed at this time. 08:20 GMT: The location of the several black boxes from the plane has reportedly been identified. The teams are still getting to them, as they lie at the bottom of the hole created by the impact, ITAR-TASS was told by Tatarstan airline officials. 08:00 GMT: A number of Russian television channels have cancelled their entertainment programs for the day - the list includes Channel 1, the country's main television news source. 07:38 GMT: RIA Novosti reports that the Kazan airport will remain closed until 14:00 local time. Tatar authorities have set up a bank account for the families of the crash victims. Also, the death of their citizen has been confirmed by the British embassy. 07:00 GMT: Vladimir Stepanov, the deputy head of the Emergency Ministry, has said that DNA analysis is the only way to identify the victims. The bodies are charred beyond recognition, ITAR-TASS reports. 06:52 GMT: Russia's Emergency Situations Ministry has sent a group comprised of psychologists and rescue workers to the scene, spokeswoman Irina Rossius told ITAR-TASS. "An ESM plane has left Moscow's Ramenskoe airfield at 10:20 Moscow time, and is headed for Kazan. A total of 30 rescue crew of the 179th Rescue division from Noginsk, including psychologists and six relatives of the deceased" are on board, Rossius said. 06:03 GMT: A total of "53 local and international flights have been cancelled" at Kazan's airport, airport spokeswoman Regina Talova told ITAR-TASS. Four flights have been redirected to the cities of Nizhnekamsk, Cheboksary, Nizhniy Novgorod and Izhevsk. The airline has delegated special buses to speed up the task. 06:00 GMT: Experts from 'Rosaviation' - Russia's federal aviation authority, will be part of a separate probe aimed at "investigating the causes and circumstances of the crash," it said in a release. 05:50 GMT: Tatarstan's Cabinet of Ministers has started the morning with a moment of silence for everyone who perished in the crash. 05:35 GMT: RIA Novosti has found that one of the pilots warned the control tower on approach that there was "an issue with the landing configuration." "He told me he would attempt to perform another circle and I dictated the numbers to him - all according to procedure - and that was that. He [the pilot] confirmed the instructions, but didn't sway from his path. [The crash] happened mere seconds later," Kirill Kornishin told Russia 24 TV, as cited by RIA Novosti. 02:11 GMT: Donna Bull, the British woman who died in the crash, was an education consultant and the A-Level program director at Bellerbys College. 01:50 GMT: The US is to send a team of experts to assist the investigation. The team will be headed by Dennis Jones, NTSB's Senior Air Safety Investigator. 01:39 GMT: Tatarstan medical officials have denied earlier media reports that some of the victims’ bodies were identified. “The identification hasn’t started yet. The bodies of the deceased haven’t been delivered to the republic’s forensic medical examiner’s office,” an official told RIA Novosti. 01:20 GMT: A British woman was among the victims of the tragic Boeing 737 crash in Kazan, local emergency officials said. Donna Bull, 53, was on the flight from Moscow to Kazan. 00:40 GMT: Poor weather conditions may hamper the investigation at the site of the crash until mid-Monday. Rain, sleet, strong winds, and a brief blizzard are expected. 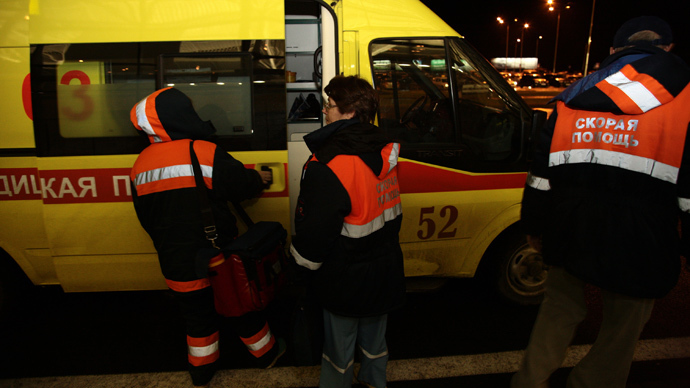 23:50 GMT: The Emergency Situations Ministry has set up a hotline in Moscow and Kazan for people needing assistance. Two thousand calls have been received so far, ITAR-TASS reported. 23:47 GMT: Emergency Situations Minister Vladimir Puchkov arrived in Kazan along with members of the government's commission for emergencies. The minister will coordinate work and assistance in the area. 23:29 GMT: The same aircraft had made an earlier journey from Kazan to Moscow and RT had a chance to speak to one of the passengers on that flight. Lenara Kashafutdinova described her experience, stating that the problem was not during the actual flight, but with its landing, which was very rocky and unstable. “The flight itself went quiet smoothly, but before the landing the plane started fiercely vibrating. Initially, I thought it was the weather, but when we got out of the plane, the weather was quite nice. The plane was shaking from side to side. We landed on our first attempt, but it was a very bad landing and I felt like the plane was going to run off the runway,” Kashafutdinova stated. 22:55 GMT: Tatarstan Airlines assures that no technical problems were found on the plane before its departure. A spokeswoman for the company told Interfax that the pilots were very experienced. 22:25 GMT: Boeing has issued a statement expressing condolences to the families of the victims of the crash and offering its technical assistance to the investigation. "Boeing extends its deepest condolences to the families of those who perished in the Aircompany Tatarstan Flight U9-363/2B-363 accident on landing in Kazan, Russia, in route from Moscow. A Boeing technical team will launch to provide technical assistance to the investigation at the request and under the direction of Russia’s investigating authority, the Interstate Aviation Committee." 22:16 GMT: The bodies of 10 victims had been identified as of 21:00 GMT, medical sources told Interfax news agency. 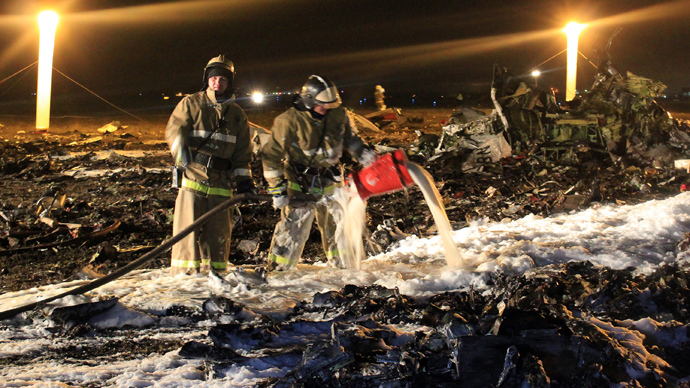 22:11 GMT: One of the reasons behind the crash could have been low-quality fuel, the Investigative Committee believes. “We ordered to take samples of the fuel that was used to fill up the aircraft in Moscow,” a senior official told ITAR-TASS. 20:20 GMT: The passenger jet caught fire after the crash landing. The flames were extinguished less than one hour into the disaster. “Only ashes and pieces of foam were left from the plane [after the explosion],” a doctor from the emergency rescue team told ITAR-TASS. 20:15 GMT: Authorities are still looking for flight data recorders. 20:00 GMT: Russian President Vladimir Putin spoke to Tatarstan President Rustam Minnikhanov on the phone, expressing his condolences to relatives and friends of the deceased, and to the Tatarstan leader personally. 19:30 GMT: Rescuers have recovered the bodies of all 50 people from the crash site, according to Tatarstan's Disaster Medicine Center. 18:00 GMT: A day of mourning has been set for November 18. 17:45 GMT: Authorities and the airline’s insurance company will pay a compensation of around US$93,700 to each family of those killed in the plane crash. 17:40 GMT: Two children were also reported killed, according to a list of victims published by the Emergencies Ministry. 17:35 GMT: It was confirmed that Irek Minnikhanov, son of Tatarstan President Rustam Minnikhanov, was among the passengers killed in the accident. The death toll also includes the republic’s head of Federal Security Service, Aleksandr Antonov. 17:30 GMT: The Federal Air Transport Agency said that 50 people - including six crew members - were on board, all of whom were killed. Initially, 44 fatalities were reported. 16:00 GMT: The Boeing 737-500 passenger aircraft, operated by the regional Tatarstan Airlines, exploded after crash-landing at the airport of Kazan at 15:25 GMT. Flight U363 was coming from Moscow’s Domodedovo airport.